From November 2 to 3, under the presidency of His Holiness Karekin II, Supreme Patriarch and Catholicos of All Armenians; a regular meeting of the Supreme Spiritual Council meeting was held in the headquarters of the Armenian Church of North America. At the opening of the meeting, His Holiness conveyed his Pontifical blessings and message to the clergy and lay members of the Supreme Spiritual Council. His Holiness expressed his approval on the joint meeting of the representatives of the Eastern, Western, and Canadian Dioceses of the Armenian Church of North America; the members of the Central Committee of the Armenian General Benevolent Union (AGBU), and the members of the Supreme Spiritual Council, emphasizing that it has of great importance for Council. His Holiness expressed his appreciation to His Eminence Archbishop Khajag Barsamian and the clergy of the Eastern Diocese of the Armenian Church of North America, for their warm hospitality. The Catholicos of All Armenians also prayed for the Holy Spirit to guide the activities of the Supreme Spiritual Council, for the benefit of the vibrancy and mission of the Armenian Church. On the agenda for the meeting are open-items on the development of the draft Constitutional By-Laws for the National-Ecclesiastical Assembly; programs aimed at increasing the efficiency of the management of the Church, and problems related to the activities of the spiritual-educational institutions and religious organizations. The Chairman of the session was His Eminence Archbishop Hovnan Derderian, Primate of the Western Diocese of the Armenian Church of North America. During the discussion of the agenda items, the members were informed about the progress of the implementation of decisions made during the Supreme Spiritual Council meeting convened in Artsakh from September 6 to 9. Mr. Aso Tavitian, President of the Tavitian Foundation, presented a report on the progress of the project to improve the operations of the Armenian Church. He reported that he has held a number of meetings with the representatives of the McKinsey & Company global management consulting firm. Mr. Tavitian discussed the project details and as a result he prepared a questionnaire on the implementation of the project, which was given to the members to complete. He also announced the composition of the executive and advisory bodies, comprised of clergy and lay members of both Armenia and the Diaspora. The Council members expressed their gratitude to Mr. Tavitian, for the work completed to date. The Council discussed the Constitutional project of the National-Ecclesiastical Assembly, which was prepared by the Constitutional Charter Committee. Archbishop Hovnan and fellow committee members His Grace Bishop Arshak Khachatryan, and Mr. Gevork Danielyan, Doctor and Professor of Legal Sciences; provided an overview of the document. The document was reviewed article-by-article, and the Council members offered their comments and suggestions. Following the necessary corrections and editing, the final draft of the constitution will be submitted to the Council members for their approval. Following this, with the blessings of His Holiness, the document will be delivered to all Dioceses for their review. 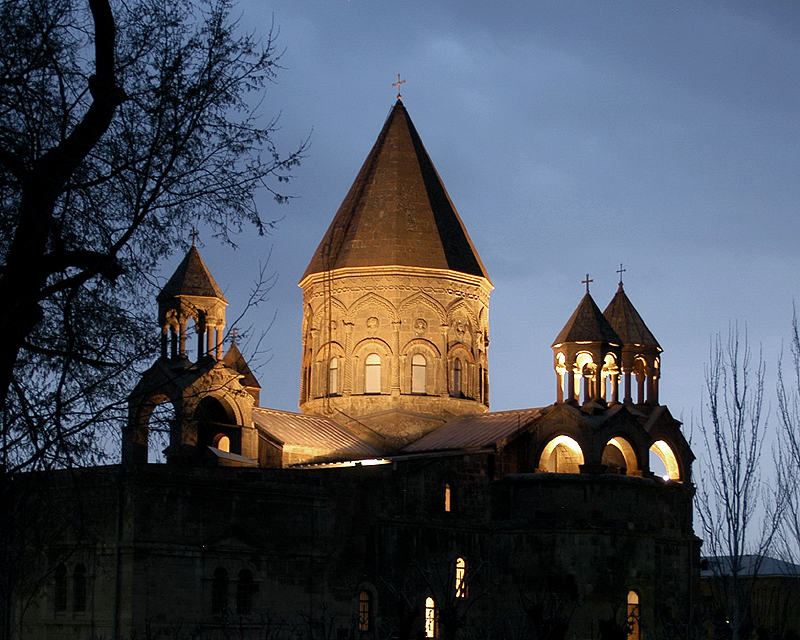 A discussion was held on the Mother Cathedral of Holy Etchmiadzin reconstruction project. His Holiness informed the Council members that the design phase has been completed and the construction work will soon commence. His Holiness also stated that steps are being taken to procure the necessary funding for construction works. The Council members accepted the outline of the process for the foundation reinforcement and renovation of the Mother Cathedral, and expressed their confidence that Armenians worldwide will provide assistance for the conservation of the sanctuary of All Armenians. His Grace Bishop Vahan Hovhannsiyan, member of the Gevorkian Theological Seminary Academic Degree Committee, presented a report on the activities of the spiritual-educational institutions of the Mother See of Holy Etchmiadzin. Bishop Vahan noted the steps that have been taken to raise the level of education in the spiritual and educational institutions over the past years. He joyfully announced that in October, the Gevorkian Theological Seminary was approved to grant academic degrees and post-graduate studies in theology. This will also contribute to raising the level of the preparedness of the clergy. They also spoke on the opportunities for clergy to continue their higher education in higher education institutions of the Sister Churches and abroad. The Council members expressed their satisfaction for the achievements recorded in the field of education, and expressed gratitude to His Holiness, for conveying great importance to the academic and pastoral preparation of the future generation of clergy. The Council noted with appreciation the cooperation that has been established between the Mother See institutions and the Ministry of Education and Science. The meeting was concluded with the blessings and prayers of His Holiness. This entry was posted in Featured News, News and tagged Armenian Church, His Holiness, New York, North America, Supreme Spiritual Council by Orthodoxy Cognate PAGE. Bookmark the permalink.